Everybody knows that a teacher’s career isn’t easy, especially if money is short – but when a classroom of sweet students came up with a solution for their teacher’s financial problems, the result was priceless. 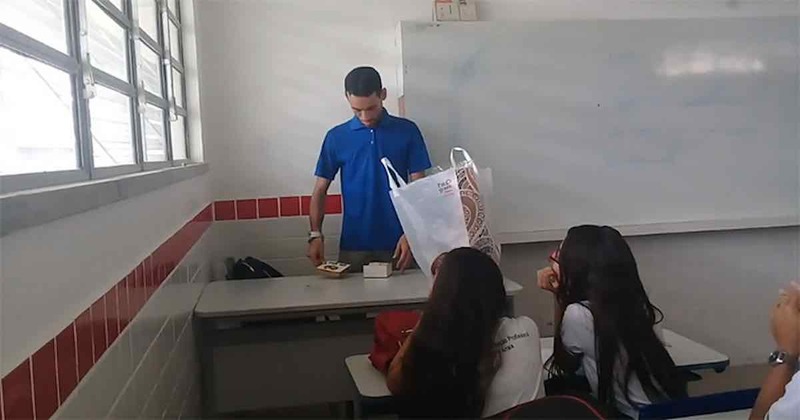 Middle school teacher Bruno Rafael Paiva from Brejo Santo, Brazil recently started his dream job of being an educator. As he expected, the work was difficult because of student behavior, low wages, and long hours. But everything was made even more grueling by the fact that his first salary was delayed for over two months. After the second month, his financial condition worsened until he was forced to sleep on his friend’s couch. When his students found about about Paiva’s plight, however, they created a raffle to raise money for their beloved teacher. The youngsters managed to scrounge together R$400 (which is roughly two-thirds of Paiva’s monthly salary). As a means of surprising him with the gift, the students – in pairs – wrote pieces of apology and acknowledgement for his efforts around the classroom. When Paiva arrived for class, they asked him to go around the room and find the papers so he could read them out loud. The last note asked him to open a box on his desk. When he saw the money in the box, he started to cry. His students immediately rushed in to hug him. If you’d like to send some money along to Paiva and his students, you can donate to their GoFundMe campaign page.